Ah, St. Patrick's Day. It's a beautiful day, one usully marked in our current year with thousands of your closest drunk acquaintances. But 110 years ago on this day, some slightly less festive celebrating took place: Eleanor Roosevelt married her fifth cousin once removed, Franklin Delano Roosevelt, future President of the United States of America. The couple had met while Franklin was at Harvard, and in October 1904, Franklin gave Eleanor a diamond engagement ring from Tiffany's (on the day of their wedding, he gave her a watch he helped design himself). Eleanor was, as you may know, the daughter of President Theodore Roosevelt's brother Elliot Roosevelt, who had died some time before. Franklin was, quite clearly, the cousin of Theodore. Their engagement was dubbed "one of the most interesting engagements of the season." Luckily for the happy couple, Ted managed to fit them into his busy schedule: he attended the wedding and gave Eleanor away, just two weeks after his inauguration. Though Ted had suggested they marry at the White House, the couple wanted it to be a smaller affair, and so they did it at the home of Eleanor's cousin Susie Parish in New York City, where she was living at the time (8 E. 76th Street). It was hard for Ted to make it up to New York, but because of St. Patrick's Day, he was going to be in town, so they scheduled the wedding between his appearance at the big parade and a dinner for the Friendly Sons of St. Patrick. Ted was definitely the center of attention that day: "He seemed to greatly enjoy the typical Irish welcome," The Lewinston Daily Sun noted of the crowds that screamed at the sight of him. "Of course, it was a great many years ago and it is difficult to remember everything," Eleanor said of her wedding on her anniversary a few decades later. "I remember spending the morning madly writing thank-you notes. "There was a great deal of excitement because of the very grand St. Patrick's Day parade. Everybody was petrified for fear Uncle Ted wouldn't be able to get through the parade to the house, but he was on time. Some of the guests had difficulty getting through. "Everybody was very polite to use and came and said howdy-do, and then congregated around Uncle Ted, and we suddenly found ourselves all alone. "That is why were are careful, if we go to any of the young people's weddings, since Franklin has been President, that Franklin doesn't take the limelight." The ceremony, which was at 3:30 o'clock, and witnessed only by a few intimate friends, in reality took place in the house of Mrs. E. Livington Ludlow, Mrs. Parish's mother, whose house opens directly into her daughter's by wide sliding doors. The two large drawing rooms on the second floor, done alike in pale amber-yellow satin brocade, were thrown into one large salon running the width of the two houses. As you can see on the left, her dress was also quite something: "a white satin princess robe, flounced and draped with old point lace, and with a white satin court train." Her "point lace veil was caught with orange blossoms and a diamond crescent," and "She wore a pearl collar, the gift of the bridegroom's mother, and a diamond bowknot, the gift of Mrs. Warren Delano Jr." She carried a bouquet lilies of the valley, and the room was decorated with a canopy of ferns, palms and pink roses. The wedding night must have been awkward. Cousin Alice had once attempted, when they were in their early teens, to tell Eleanor the vague details she had gleaned about the facts of life. "I almost came to grief," Alice recalled. "She suddenly leapt on me and tried to sit on my head an smother me with a pillow, saying I was being blasphemous. So I shut up and I think she probably went to her wedding not knowing anything about the subject after all." 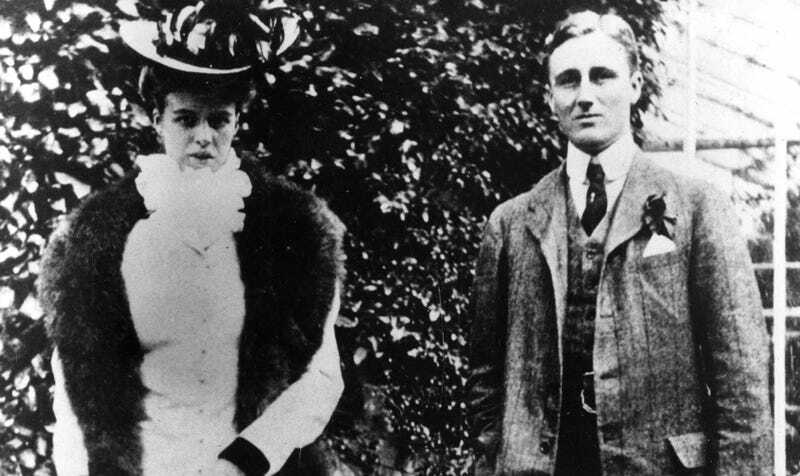 We do know the Roosevelts had a nice partnership, despite their complicated and imperfect marriage. And despite Uncle Ted.